Refractories can be evaluated after their service life to collect critical information that may be used to guide product development and lead to improvement in performance. Evaluation may be conducted after years of service or immediate after a catastrophic failure. Evaluation of a used refractory material may include chemical analysis, measurement of physical properties, measurement of mechanical properties, and/or examination of the refractory microstructure. The American Society for Testing and Materials (ASTM) provides many standard procedures for measuring these properties. Chemical analysis of refractory materials is typically accomplished through a combination of X-Ray Fluorescence (XRF) and Inductively Coupled Plasma (ICP). A common approach is to analyze the chemistry of the hot face or affected area and the cold face or unaltered area. A representative sample is cut from the refractory and ground into a powder specimen. The specimen is prepared further in the laboratory for analysis. With knowledge of the chemistry, it may be possible to determine what might be affecting the refractory while it is in service. Physical properties that are commonly measured include percent porosity, bulk density, reversible linear expansion behavior, permanent linear expansion, pyrometric cone equivalent (PCE), permeability, and abrasion resistance. Again, specimens from the hot face or affected area and the cold face or unaltered area are typically measured and compared. If a cold face or unaltered area is not available, it is preferred to measure unused material. In the event that unused material is not available, measured data can be compared to the manufacturer's data sheet. From the measurement of physical properties, it may be possible to determine if the service conditions are affecting the refractory, if the refractory was manufactured properly, or if the refractory was installed properly. Mechanical Properties that are commonly measured include flexural strength, compressive strength, and creep behavior. Flexural and compressive strength may be evaluated at ambient or elevated temperatures. The creep behavior may be measured using different test temperatures, stresses, and loading types (compressive or flexural). From the measurement of mechanical properties, it may be possible to determine if the service conditions are affecting the refractory, if the refractory was manufactured properly, or if the refractory was installed properly. 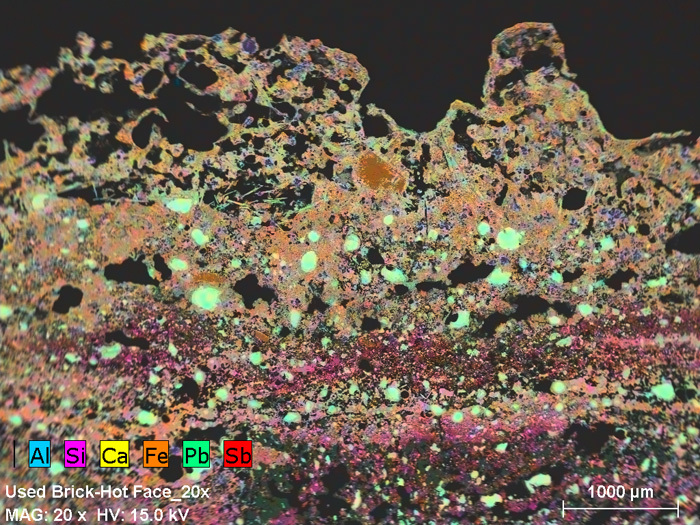 In some cases, particularly if corrosion is suspected, it may be beneficial to closely examine the refractory microstructure. Optical and/or scanning electron microscopes (SEM) are typically utilized. Specimens from the hot face or affected area and the cold face or unaltered area are typically examined. Electron microscopes equipped with energy dispersive spectrometer (EDS) can collect chemistry data and this information can be overlaid on the image to produce chemistry maps. Refractory post-mortem analyses provide valuable, technical information. This information can lead to enhanced refractory properties through research and development, process changes, or design changes. Furthermore, this information can lead to reduced downtime, longer refractory, life, and more efficient processes.